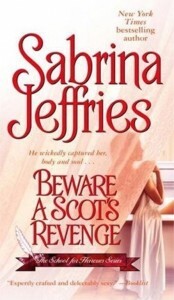 This time, we’re reviewing Beware a Scot’s Revenge, by Sabrina Jeffries. “Someone’s going to call your bluff someday, Venetia – you’d better hope it’s not a handsome man.” – Mrs. Charlotte Harris, headmistress. 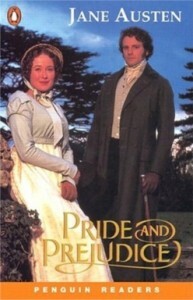 When Elizabeth Bennet first meets eligible bachelor Fitzwilliam Darcy, she thinks him arrogant and conceited, while he struggles to remain indifferent to her good looks and lively mind. 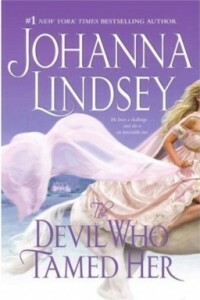 When she later discovers that Darcy has involved himself in the troubled relationship between his friend Bingley and her beloved sister Jane, she is determined to dislike him more than ever. In the sparkling comedy of manners that follows, Jane Austen shows the folly of judging by first impressions and superbly evokes the friendships, gossip and snobberies of provincial middle-class life. Belle: Dear Readers: I apologise for Withholding from you the delights of our reviews but Sadly one of our readers had the unmitigated gall to send us Fan Fiction. As you know, Claire and I despise fan fiction. We do not pursue it legally because we believe in freedom of speech, but it is vile and all those who write it are despicable plagiarists scavenging from the works of Real Authors like vultures scavenging a maggot-ridden corpse. 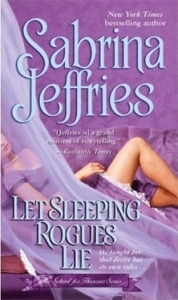 Webmistress Niki: Belle was a little upset, so we took a brief hiatus from reviews. Seven hundred years ago, a Black Widow witch saw an ancient prophecy come to life in her web of dreams and visions. Now the Dark Realm readies itself for the arrival of its Queen, the Witch who will wield more power than even the High Lord of Hell himself. But the Queen is still young, still open to influence—and corruption. Whoever controls the Queen controls the Darkness. Three men—sworn enemies—know this. And they know the power that hides behind the blue eyes of an innocent young girl. And so begins a ruthless game of politics and intrigue, magic and betrayal, where the weapons are hate and love—and the prize could be terrible beyond imagining…. 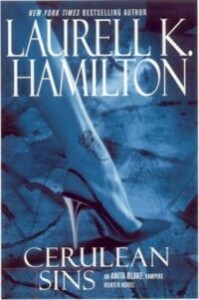 When Madeline Prescott took a teaching position at Mrs. Harris’s School for Young Ladies, it was to help restore her father’s reputation. Instead, she’s in danger of ruining her own. The devilishly handsome Anthony Dalton, Viscount Norcourt, has agreed to provide “rake lessons” to Mrs. Harris’s pupils so they can learn how to avoid unscrupulous gentlemen, and Madeline is to oversee his classes. She has always believed that attraction is a scientific matter, easily classified and controlled — until she’s swept into the passionate desire that fiercely burns between her and Anthony. Nothing could be more illogical than risking everything for a dalliance with a rake — even one who’s trying to behave himself. Yet nothing could be more tempting…. Anita Blake, Vampire Hunter is not quite as human as she once was. Consumed by both the lusts of the vampire and the primal hungers of the wereleopards, her desires must be sated. But it is Jean-Claude, the Master Vampire, who needs her now. In this pulse-pounding new story of suspense and sensuality, Anita will need to muster all the dark forces of her passion is she is to save the ones she loves the most.